What is “Money Bee” mobile slot about? 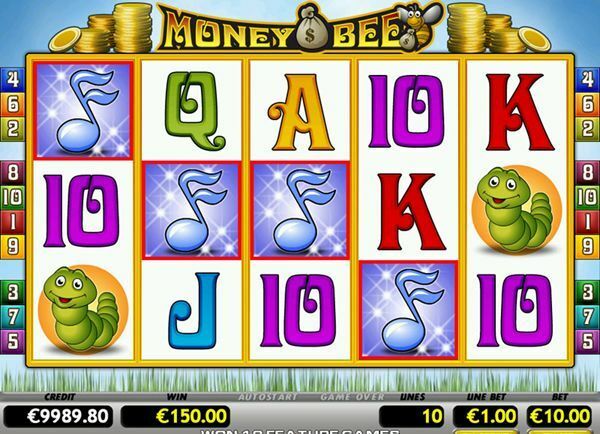 Money Bee is a 3-row slot game from the Slovakian developer iGaming2Go. This is a 5-reel game which pays on five paylines. There are wild and scatter symbols and free spins, but there are no multipliers. This slot game has a jackpot of 5,000 coins, but there is no progressive jackpot. This is a low volatility game, as the return to player amount is just 94.92% and the house edge is 5.08%. Money Bee is an insect themed video slot machine. Even from the first glance the player will notice that the game has average graphics and sounds with a pretty simple gameplay. Even though it is bright and colourful, the graphics are not impressive. The symbols of the slot include the money bee, a snail, a caterpillar, a music sign, and the ordinary playing cards: ace, king, queen, jack and ten. This slot is another iGaming2Go game that will play nicely on all mobile devices. It was built in HTML5 and it runs on all Android devices, Windows smartphones, iPhones, and tablets. It can be played online, but there is a downloadable version available as well. There is an auto start option, which helps keep the reels spinning until there is a winning combination. The maximum bet per spin on this slot is 5.00 and the minimum cost per spin is 0.10. The coin value ranges between 0.10 and 5.00. In order to win the jackpot in this game the player should get five of the Bee symbols spinning in on an activated payline. The maximum coin win is 5,000. The wild symbol of the game is the money bee. It can substitute for the other symbols, except the scatter ones, to form a winning combination. This symbol pays out the highest amount of 1,000x the bet. If the musical note symbol appears on the reels, the free spins are triggered. This is the scatter symbol of the slot and if the player lands three or more of them from left to right on the reels, they will win 10 free spins, however these free spins do not have any multipliers attached to them. If the lady bug symbol appears on the reels during the free spins, the winnings from the free games are doubled. There is a gamble feature in the video slot available. The player can put up the money from any winning combination and the bet can be doubled or lost. For that they have to guess whether the next playing card will be either red or black. Five reels, five paylines. Simple as that.